When it comes to makeup and all things beauty I am a high street/drugstore brand gal through and through, but over the past few years I have began to explore higher brands more so and have come to discover a few favourites of mine, with some products now being my holy grails. One brand that I absolutely love and have a fair few favourites from is Lancôme, and with their summer collection having recently released I thought i’d give you the low down on why you need to check out this collection! Continue reading to hear my thoughts on this dreamy new summer collection from one of my favourite brands! Every year most high end brands release limited edition collections especially for Spring Summer, so when I found out Lancôme were releasing a collection all about getting your glow on I was over the moon, and even more over the moon that they sent over some products from the collection to try, and let me tell you they have not disappointed me one bit! 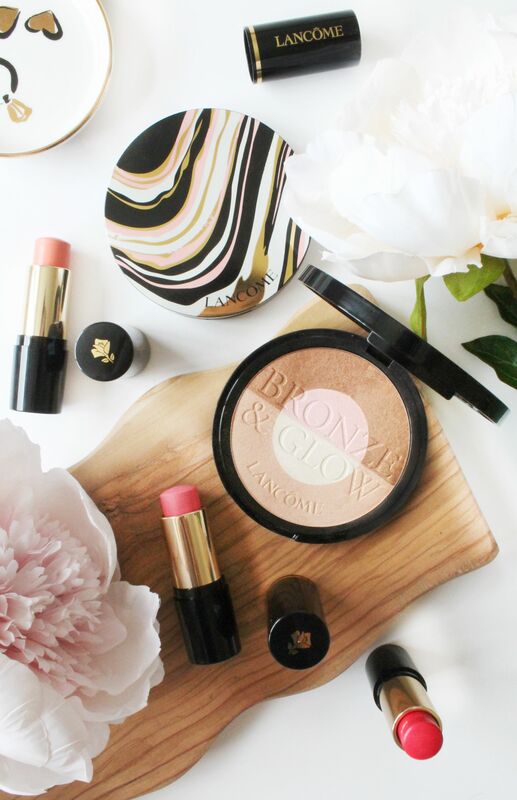 During the summer months I love nothing more than looking glowy and bronzed, and the new Lancôme Bronze & Glow Powder* (£42) have already become my daily go to products. This product itself comes in two different shades with the more bronzer shade called ’01 It’s Time To Glow’ and the more blusher/highlighter shade called ’02 Your Pink Glow Shot’, and I’ve been using both of these so much over the past couple of weeks. I absolutely love the two bronzer shades with the bronzer powder and I find myself naturally swirling my brush between the two shades to get the perfect bronzed glow to the hollows of my cheeks bones. I’ve then been going in with the blusher shade and applying this to the apples of my cheeks as the pink is such a lovely subtle colour but adds a beautiful pop to a bronzed look. I’ve then finally been going in with the almost white highlighter shade and applying this with a fan brush to anywhere I want to add highlight and it just pops in a beautiful yet natural way. Another thing I really like about these powders is the size of them as they are bigger than your average bronzer and hold a lot more product also, and as i’ve found a little definitely goes a long way with these powders. I also find the longevity of this product throughout the day just goes to show why you’d pay a little more for this product as it stays put, unlike cheaper everyday bronzers you’d buy from the high street/drugstore. If like me you love having a bit of glow to your every day look and are on the look out for a new product i’d highly recommend checking out this product from Lancôme because they are truly stunning, and the product itself is going to last such a long time and is worth every penny if i’m honest. The second product from this collection is the Lancôme Blush Stick* (£27) which comes in three different shades all of which are stunning! Out of the three shades my favourite is the shade ‘Rosy Flush’ which as the name would suggest is a beautiful rosey pink shade that gives you a lovely natural looking flush to the cheeks that I love! I’m going to be honest, I haven’t used any cream based blusher for a long while now so I was skeptical as to whether I would like these, but I absolutely love them! They aren’t too creamy and dry down so beautifully without looking cakey like some cream based blushers can do. I also usually find the cream based blusher often slide off your face throughout the day especially when the weather is as hot as it has been but this doesn’t what so ever as it lasts so well throughout the day. So those are the two limited edition products Lancôme have released as part of their Summer Collection and my thoughts on them! If like me you love a limited edition collection and are wanting some new products to try then i’d really recommend checking out this collection! Have you tried any of Lancômes’ newest products?